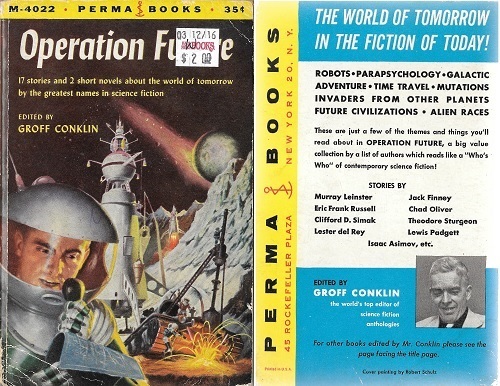 Let's read four more stories from 1955's Operation Future! 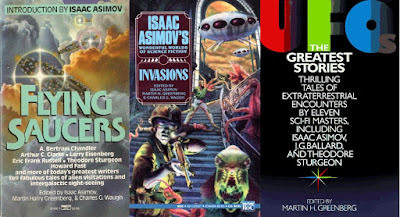 Today we'll be looking at tales by relatively well known members of the SF community: Eric Frank Russell, Clifford D. Simak, Lester del Rey, and Damon Knight. "Exposure" is a joke story about aliens who land in a secluded forest in the United States and go about collecting samples of Earth life; their people plan on conquering Earth and enslaving us natives, and this recon ship is here to learn as much as they can about us before the assault is launched. These aliens are shape-shifters, and after they have collected (and dissected!) two human beings from a camp, their best scouts take on the appearance of humans and try to infiltrate several nearby towns in order to investigate our weapons and energy technology. The punch line of the story is that the aliens took their sample humans from a nudist colony, so their scouts have no clothes and are immediately picked up by the authorities, which foils their reconnaissance mission and ultimately spares Earth the calamity of invasion. This is a humorous story and it is full of little jokes, but Russell plays it straight; this is not a farce or an extravagant satire, and the jokes come out of believable characters and situations and are actually amusing. The aliens and their recon methods are convincing and interesting, and I enjoyed the story as much or more for its "serious" bits as the comedy. I can see why "Exposure" has been so widely anthologized--it is quite good. "Exposure" first appeared in Astounding. 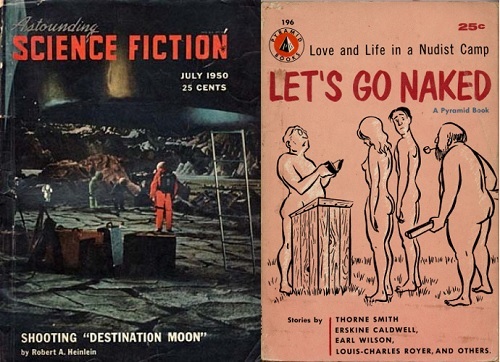 Also pictured: a 1956 edition of Let's Go Naked. 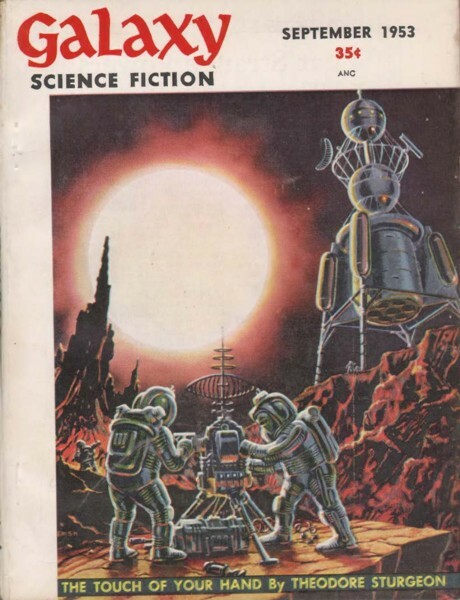 I haven't read any Simak in a long time. 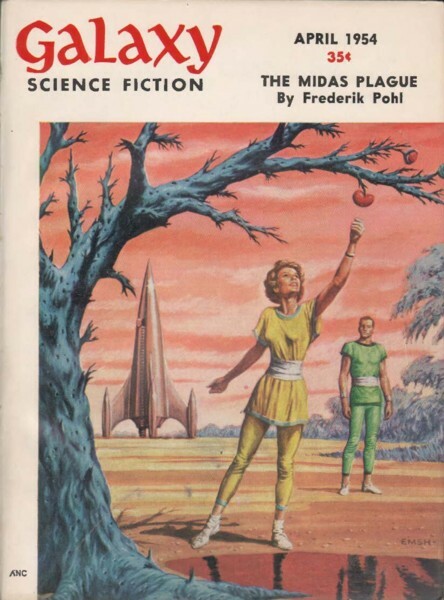 I think Simak is a good writer, but I find his anti-modern, anti-urban, anti-industrial attitude a little tiresome. Maybe it is just me, but I don't actually think the world would be a better place if the only humans left were roving bands of Indians who leave the cities to intelligent dogs and robot priests. Simak was a newspaperman, and "Worrywart"'s text draws on this knowledge, and talk of how a 1950s newspaper was run adds some additional interest to the proceedings. Our protagonist is a copyreader who comes across a number of stories describing almost impossible events, like a terrible plane crash which all the passengers survive and the miraculous recovery of a terminally ill child, and investigates possible connections between them. He discovers that a man with amazing mental powers must be at the bottom of these unlikely deliverances. This guy was an invalid as a child, and did lots of reading and fantasizing. Somehow his fantasizing about travelling to other planets has put him in touch with alien intelligences, and this relationship has given him the power to manipulate matter, time and history! If he wants something to happen, or something to unhappen, he can make it so! The psychic is very agitated about the possibility of a major war. ("He's hell bent...to bring peace to the world," one character says of him.) One assumes Simak is alluding to Cold War tensions (1952 and 1953 saw lots of exciting Cold War incidents, including Stalin's death, anti-Communist uprisings in Czechoslovakia and East Germany, the execution of the Rosenbergs, various nuclear weapons tests and the tail end of the Korean War) but Simak studiously avoids mentioning such words as "Cold War" or "Soviet Union" or "communism." Perhaps Simak was chary of offending readers who had taken sides in the political and ideological struggle between the East and West; we don't all have the courage to say what we really think about the people who pay our bills, the kind of courage we see in Drexel professors. Our newspaperman worries that the psychic, who has lived a sheltered life and never been to school and so is very naive, will clumsily use his astonishing powers in an attempt to ensure peace, perhaps in a way that will cause more problems than it solves. 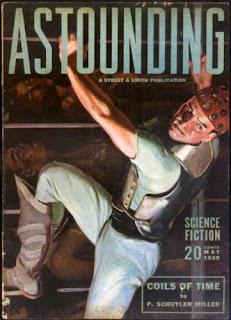 The newspaperman is aware that the psychic reads science fiction stories, and when he finds that a new magazine includes a story about a man who ends modern war by outlawing electricity, his worries go into overdrive--by tinkering with man's knowledge of electricity, or the natural phenomena of electricity itself, the naive psyker may impoverish mankind or even destroy the universe! This story is well written and well paced and all that, so I don't mind recommending it, even if the plot is a little silly. All you SF scholars out there can compare it to the famous Jerome Bixby story about a naive person who wields godlike power, "It's a Good Life," which was published the same year as "Worrywart." Del Rey's last name is very familiar to me from the spines of Ballantine science-fiction and fantasy paperbacks (he and his fourth wife Judy-Lynn were both important editors) but I haven't read a whole lot of his fiction. When I read the short version of Nerves back in 2014, I thought it long and boring, but on this topic I was swimming against the tide: that version of Nerves has been widely anthologized and even included in the Science Fiction Hall of Fame, and Conklin praises Nerves in his intro here. All you paleontologists and anthropologists will be thrilled to hear that "Day is Done" is about cavemen! Del Rey spins the sad tale of the last Neanderthal, Hwoogh, who is not only driven out of the hunting business, but insulted and abused by the smarter, more dextrous, and more technologically advanced Cro-Magnons who moved into the area when Hwoogh was young. They even violate his cave, which everybody knows is a caveman's safe space! Del Rey describes these peoples' biology and culture in some detail; I have no idea how much of what del Rey tells us is based on scientific research and how much he just came up with. Whatever the case, this story is entertaining enough, and will perhaps resonate with readers who have grown old and feel obsolete, or have witnessed their culture, people or way of life demeaned and swept away. 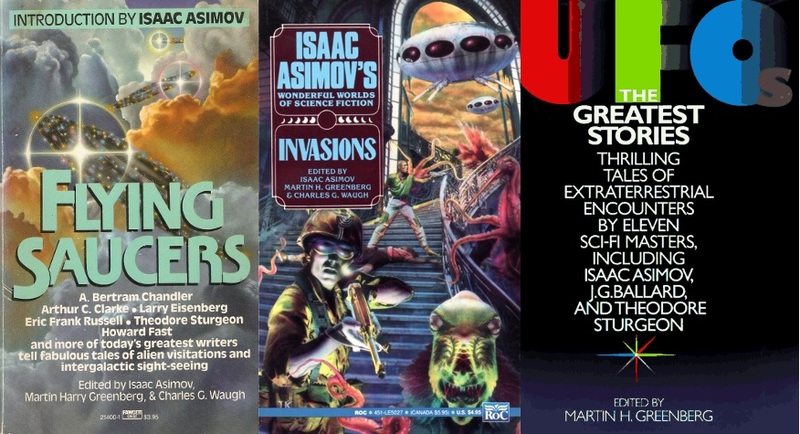 Like del Rey, Knight may well be more important as an editor than a writer, but I have actually read a bunch of Knight's own fiction, as well as stories he edited for such publications as the famous Orbit series. It turns out that "Special Delivery" is a commonly used name for short stories; Kris Neville published a story called "Special Delivery" two years before Knight's. Neville's "Special Delivery" was about an alien spy softening up Earth for conquest, while Knight's "Special Delivery" exploits new parents' anxieties about their children and how a baby will change their lives, and features some of the whining we never stop hearing from public school teachers about how the taxpayers don't shovel enough money into their pockets. The baby, whom Moira names after Leonardo da Vinci, starts running the household by threatening to kick if he doesn't get his way. Leo gets Len fired from his teaching job, forces Moira to read stacks and stacks of challenging books, and refuses to let Len sleep in the same bed with Moira! Len and Moira fear that Leo will become a dictator and rule the world with an iron fist once he is free of the womb, but they needn't have worried: Leo's genius is the result of the low oxygen environment of the uterus; once he has to breathe normal air he reverts to being a normal infant, ignorant and helpless. Not bad. All you SF scholars out there can compare this to Bradbury's 1946 "Small Assassin" and Kuttner and Moore's stories about troublesome kids in conflict with their parents, like 1944's "When the Bough Breaks" and 1946's "Absalom." It's true: babies are scary! All these stories are entertaining and worth the SF fan's time; the Russell and Simak indulge in far-out SF concepts but reflect the anxieties of a world embroiled in the Cold War in which the cataclysm of World War II was a recent memory, while the del Rey and Knight allegorically treat our personal worries about our places in the world and in our families. Operation Future is a worthwhile purchase.